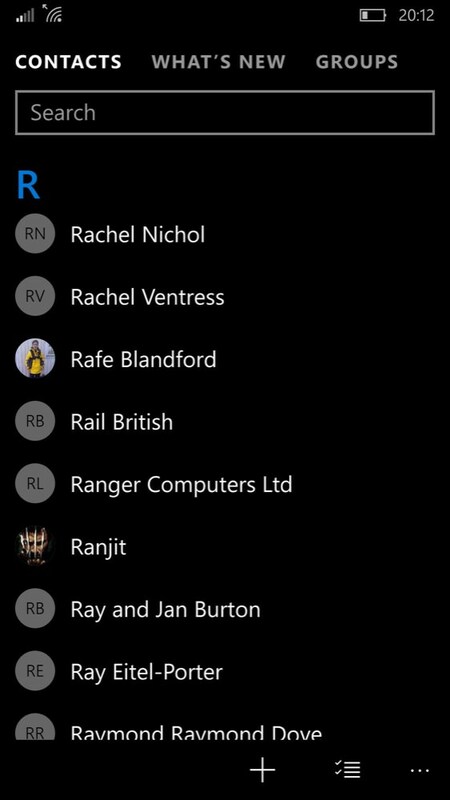 I have five contact stores linked into my Windows Phone (for which, read Windows 10 Mobile throughout, as everything's nearly identical - in fact, I'm using screenshots from W10M), and I don't think I'm unusual. Outlook (i.e. my Microsoft account), Facebook, Gmail (i.e. my Google account), Twitter and Skype. All common services that almost everyone reading this will have. And each has its own list of contacts, together with both generic and specific information. Although there's some facility for importing and exporting these lists, as a rule they stay separate online, meaning that you've got a bit of a potential headache if you want to try and keep a handle on everyone you know. 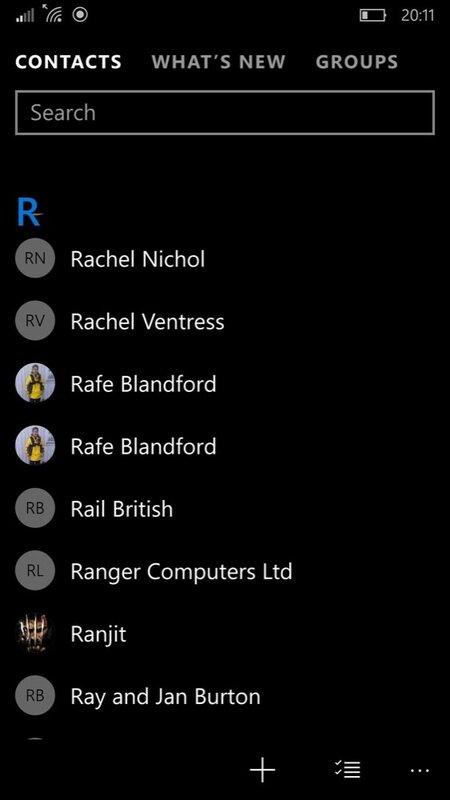 Here neatly demonstrated in Windows 10 Mobile's People, the various contact stores that are synced in, and showing that not all are presented by default - here I'm going all-in and including my Skype contacts too! 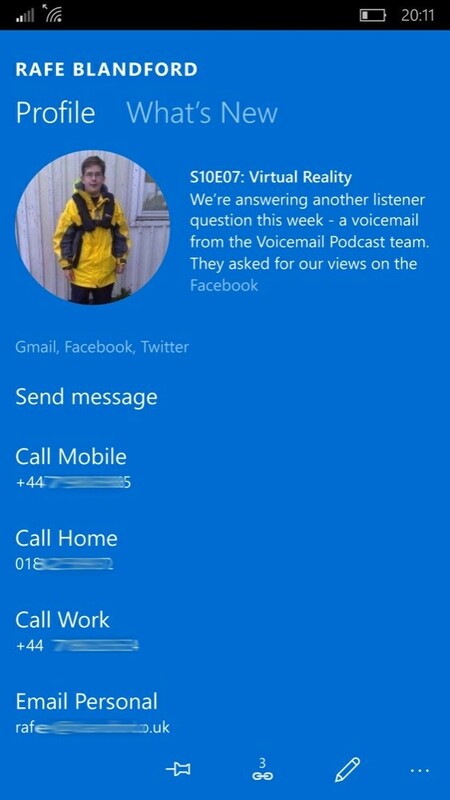 Or at least you'd have a headache if you didn't have a smartphone, specifically a Windows Phone, since the core People application is quite happy showing contact information from all of the above. And, in many cases, there's enough common data that the app can intelligently amalgamate information about a person from multiple sources into one entry on your phone screen. So, for example, "Fred Smith" would show detail from your entry for him in Google Contacts, in your Live.com contacts and from Skype. All neatly combined for your convenience*. * Of course, the combination is purely functional on the phone - the tech world long abandoned trying to sync every amalgamation back to the original servers in an attempt to bring all contact store sinto perfect sync. That way lies madness and massive contact duplication! 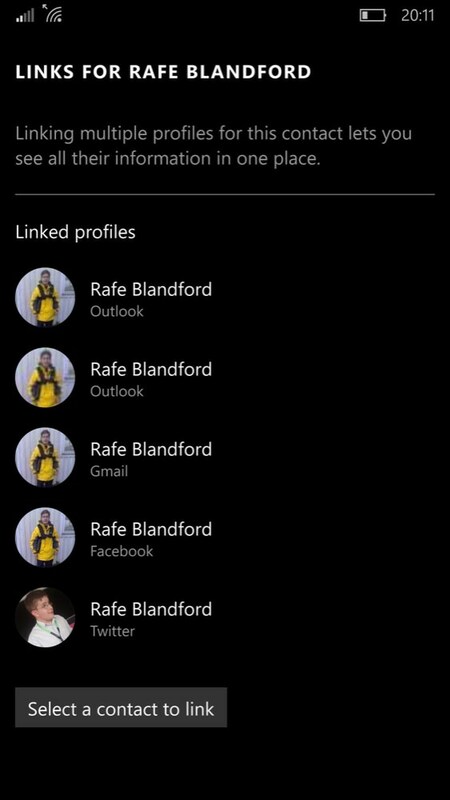 Before looking at People on your Windows Phone, start on the servers. In this case mainly Google Contacts and Microsoft's Outlook.com, each of which contains a prominent de-duplicator. After all, if there are duplicates on the servers before these lists even get synced to your phone then you're already off to a tricky start. On Google, switch from Gmail to Google Contacts and you'll see 'Find duplicates' on the left hand side toolbar. Use it and I'll bet you find a dozen or more duplicates (usually with variations in email or phone number) that the service can instantly merge. On Microsoft's Outlook.com (aka Live.com/Hotmail.com, etc. ), go to the 'People' view and then click on the 'Manage' drop-down, choosing 'Clean up contacts'. Cleaning up duplicates in Microsoft's online Outlook.com. By the way, notice the mispelling of my dad's surname on the left - typos are another common cause of duplicates, though - obviously - fixing these needs you to go in and fix the typos! 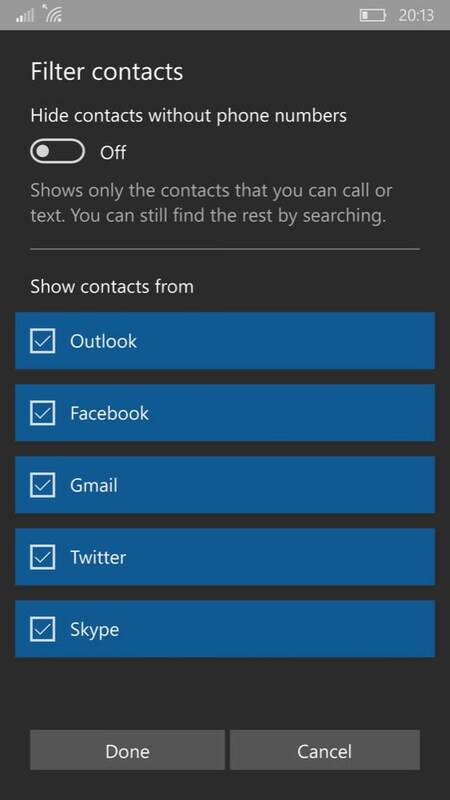 Having sorted out duplicates online, give it half an hour or so to make sure that these streamlined contact stores are fully synced down to your Windows Phone. You can also try refreshing your mail acounts for these, since that should also kick off a sync. 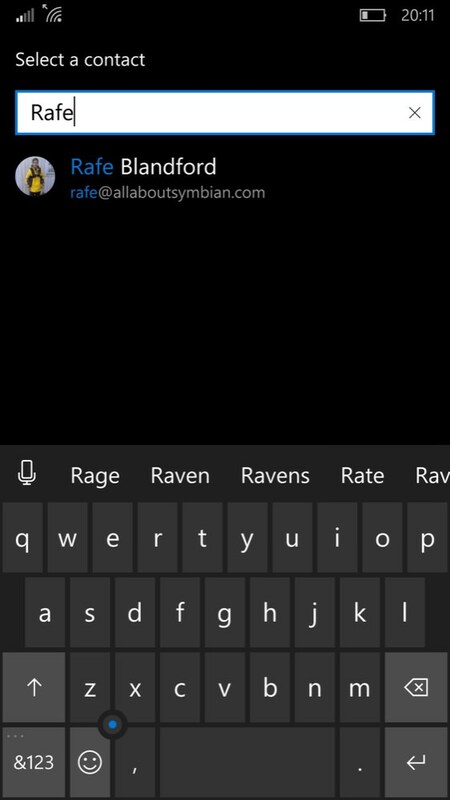 Under Windows Phone 8.1, the suggested duplicate will be shown, just tap on it to accept and you're done. 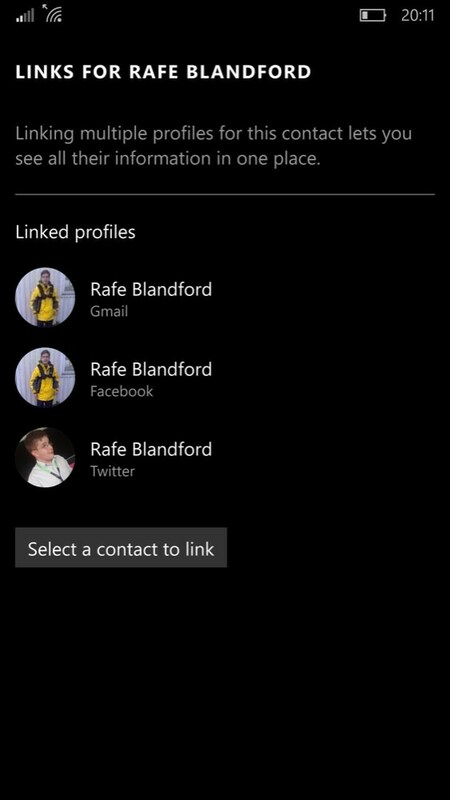 Under Windows 10 Mobile (shown above), tap on 'Select a contact to link' and then quick match/search the contact's name to find the one you want to link/merge in. Tap the back control twice to return to your People list of contacts - the duplicate will now be gone (above, right) and all information for that person will be under the one entry. Now rinse and repeat for any other obvious duplicates in your close family and friends that have been annoying you! As hinted above, our contacts stores have been through so many changes and processes over the years (mine started in 1993 on a Psion PDA!) that every single person's store will be 'imperfect'. Old information, badly formatted addresses, mistyped names, and more. Obviously, when you come across an entry that badly needs pruning or updating then do it on the spot, if you have time (and the changes will be synced up to the appropriate servers in due course), but don't be too obsessive over it. Just accept that, along with your family and friends and their own details, your People/contact store is always going to be something of a work in progress... and get on with your life!